The Verbal Habitionary offers portmanteau words (a blend of words) to give us all the vocabulary to talk about – and find solutions to – our increasingly ubiquitous verbal habits that are undermining our communication, watering down our meaning, and distracting our listeners. noun. 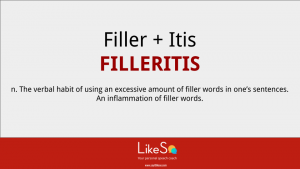 The verbal habit of using an excessive amount of filler words in one’s sentences. An inflammation of filler words. Noun. 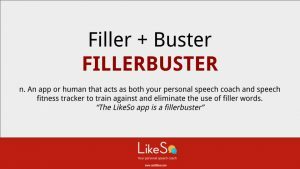 A specific app that acts as both your personal speech coach and speech fitness tracker to train against and eliminate the use of filler words. Adjective. 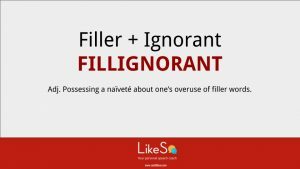 Possessing a naivete about one’s overuse of filler words. 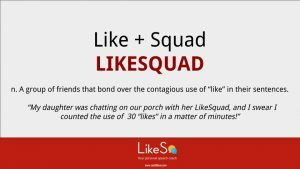 Use in a sentence you say? 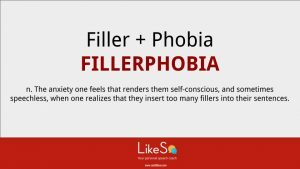 Noun: The anxiety one feels that renders them self-conscious, and sometimes speechless, when one realizes that they insert too many fillers into their sentences.